Do you find yourself sweating when you are driving in the summer months? Do you long for a way of cooling off? Do you long for a vehicle with seats that will help you get air to your body? 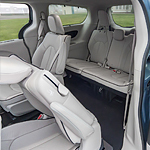 The Chrysler Pacifica Hybrid gives you the option to have ventilated front seats in place to help you stay comfortable. If staying cool isn't something that you struggle with but staying warm is, you will appreciate the heated seats that you can add to the Chrysler Pacifica Hybrid. You can make the front seats of this vehicle heat up, and you can also add a heated second row of seats to the vehicle.